**Side note on 3/20/2016: This review was written in 2013 when I was still greatly obsessed with K-drama and all things K-drama including the entertainingly written Dramabeans discussion blog about all things K-drama. Three years into the present, I'm not sure I would have given this book such a high rating as it turned out to be little bites and snippets, not quite worth the money paid for it, and slightly unsatisfactory--reading between the lines at the Dramabeans blog would have given the same information, really. But as a contribution to the girls who upkeep the K-drama blog, that gives K-drama fans great discussion and entertaining reading, I think it's money well-spent. Thus, I don't regret spending the money. For someone not so inclined to love K-drama, this is not the best book in the world. Below the short review, you will find a sort of first impression post written the exact same day. This was an extremely short book at under 100 pages (97 pages on the Kindle). Also, it seems that Part 2 was either never written, or I just missed it somehow. 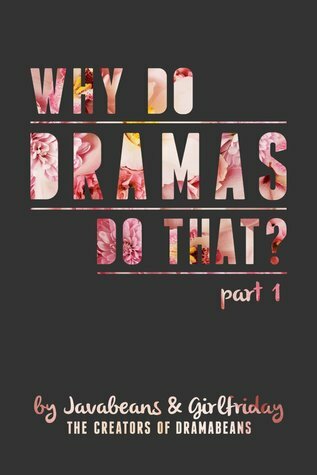 Well, it wasn't what I was expecting (not all of it), but I still had fun reading through this little "guide" for K-dramas. Some sections I kind of hoped would have been a little bit longer with some more examples from drama-land, but we take what we get, right? Still, it was just as entertaining as it usually is reading from the Dramabeans blog, and for that, I'm satisfied. As I said before, I will read anything these ladies churn out, even if I don't always agree with some of their opinions. They are witty and creative and that, for me, is just enough. I mean, sometimes reading their drama series recaps and reviews are just so much more fun than actually watching the drama series itself. Looking forward to Part 2 now, which I'm sure won't be far behind. In an entirely biased opinion, I will read anything that these ladies write (whether or not I like or agree with them is a different story), so when I learned that they were pushing out a book about their opinions on K-drama pop culture, I was pretty ecstatic.